As the year 2000 approached, we all had different impressions and feelings as we look back at the past and look forward to the future. At the Collectible Show in Long Beach, California in 1999, Karla Steinbach shed some light on the development process of the new Herr Steinbach Millennium (ES2000/ml) nutcracker. The computer on the base of the nutcracker was included as a symbol of the “Computer Era”. Of course Herr Steinbach remembers when they did every thing at the factory without computers and he even wrote a computer program that the factory used for production. The rocket ship symbolizes that the Steinbach’s witnessed the beginning of the Space Age and the first encounters in space travel. The coin that the Herr Steinbach nutcracker holds represents the new European currency and the future of their homeland. This is the first nutcracker in the Steinbach Millennium Nutcracker Series. 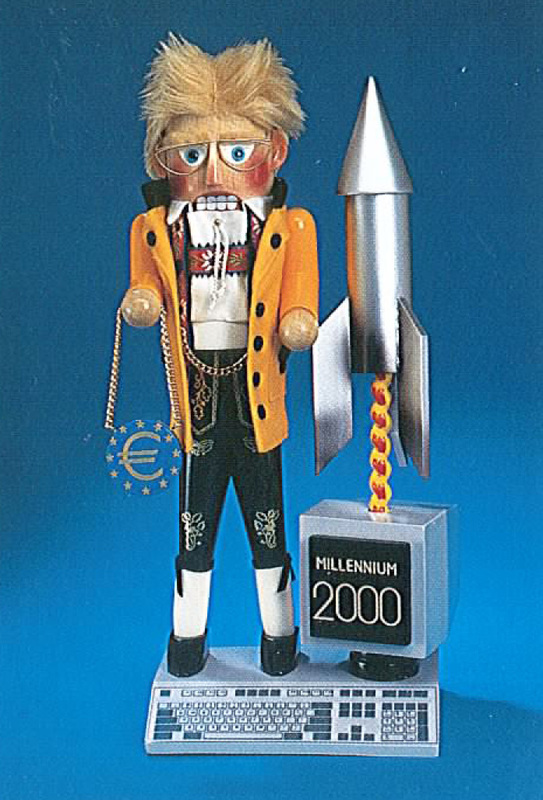 In 2000 Steinbach welcomed in the 21st century with the Millennium Angel and added another nutcracker into the Millennium Nutcracker Series. What better way for Steinbach to welcome the new Millennium that with a nutcracker that brought with it the message of “Peace on Earth”? As we looked forward to the new century, it was and still is important to remember how global our society has become and Steinbach reminded us of this with this heavenly angel that holds a world in her hands. 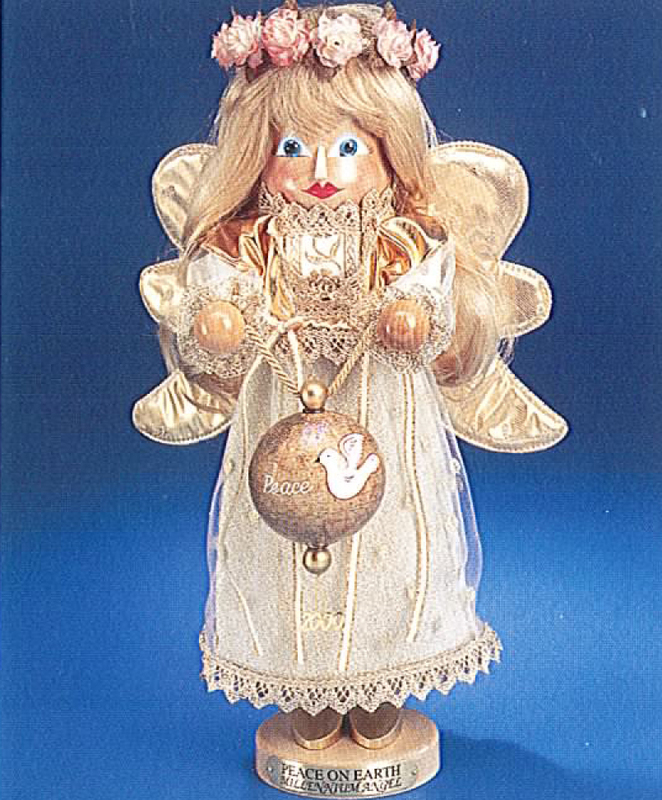 This angel nutcracker is special in two ways. First of all as many collectors realize, it is rare for the Steinbach factory to produce a female nutcracker. This is due to the history of nutcrackers being guards or protectors with ferocious teeth; traditionally nutcrackers have rarely taken the female form. However on special occasions Steinbach does bend the rules. This Millennium Angel (ES1681/MIL) also had a small production run of 2000 pieces and they where all pre-signed by Herr Steinbach himself! This is the second nutcracker in the Steinbach Millennium Nutcracker Series.